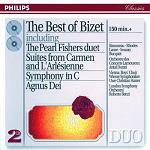 Geores Bizet is best known for his operatic masterpiece, Carmen. Not so well known is the fact that he died from a heart attack only a few months after its first performance at the age of 36. Death at such a young age immediately reminds us of Mozart, Mendelssohn and Schubert. His life parallels these composers also in the sense that he was yet another musical prodigy whose ability, encouraged by his musical parents, was exceptional. Despite being against the rules, he was admitted into the Paris Conservatory at the phenomenal age of 9! He was born in Paris and originally registered under the name Alexandre César Léopold Bizet, but then baptised as Georges by which name he was always to be known. With the exception of a few years in Rome, he stayed in or near Paris for most of his life. At the Conservatory he studied under many great musicians including professor Jacques Halévy. The Halévy family were to have quite an impact on Bizet's life, not least the fact that he was later to marry the professor's daughter Geneviéve and father a son Jaques, perhaps named after his grandfather. Continuing his precocious youth, he composed his first Symphony (in C) at age 17 (modelled closely on Gounod's Symphony No. 1 in D). Then in 1857 having previously won several prizes at the Conservatoire, he won the prestigious Prix de Rome. The comtemporary French composers of the day which influenced Bizet to varying degrees included Charles Gounod, Léo Delibes, Camille Saint-Saëns, Jules Massenet and the German born Jacques Offenbach. All of these were opera composers to some extent though often light or comic opera. 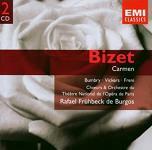 In comparison, Bizet's operas and particularly Carmen tended to stand out as highly dramatic and dealing in deeper emotions. Though not straying too far from French traditions, he perhaps adopted some of the styles of Italian and German opera from Verdi and Wagner respectively. While he did make use of the newly invented Saxophone, he wasn't particularly known as a trend-setter. He seemed to change direction several times, dropping ideas that he had started, and seemingly insecure and sensitive to criticism. Although perhaps expected of artists, the public probably thought of him as something of a Bohemian outsider. Musically, he seemed to have a natural gift for melody and a certain artistic confidence seems to flow from his music. When the Franco-Prussian war broke out in 1870, although exempt from national service as a Priz de Rome winner, Bizet nevertheless enlisted in the National Guard. 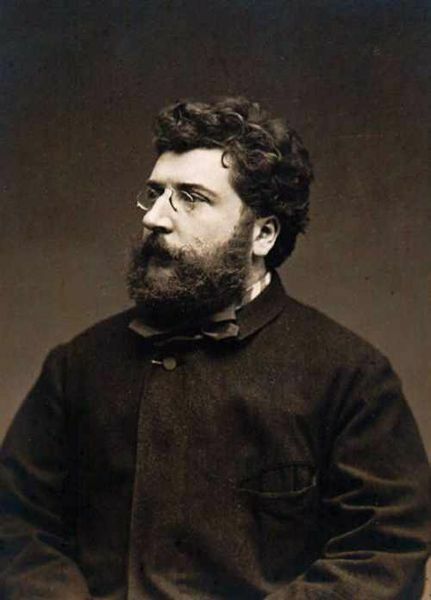 Although many of his coutrymen and fellow musicians were highly nationlistic in their approach to the war, Bizet was far more down-to-earth in his understanding of the real horrors of war. Again we see a realism in his outlook on life which also manifested itself in his operatic story-telling. Opera - Carmen, in 4 acts, the most famous which we describe in more detail below. Orchestral suites from this opera are sometimes performed as stand-alone works in the concert hall. Jeux d'Enfants for piano duet is a delightful set of 12 pieces, each based on a different game (many still familiar today), including "The Swing", "The Top", "The Doll", "Wooden Horses", "Battledore and Shuttlecock", "Trumpet and Drum", "Soap Bubbles", "Puss in the Corner", "Blind Man's Bluff", "Leap Frog", "Little Husband, Little Wife", and "The Ball". All of these are great fun to play and as a sample, in our customary Sheet Music, MIDI and MP3 formats, we include La Toupie (The Top) and La Poupée (The Doll). 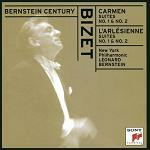 Just like Carmen, music from L'Arlésienne has been used in many places. One example is an episode called "Hammer Into Anvil" from the TV Series "The Prisoner" where the music is used both as source music and as underscore. The story is based on a short novel by Prosper Mérimée about a Spanish gypsy. Carmen is one of the girls working in a cigarette factory. She seduces a soldier Don José, then dumps him for a Matador, Escamillo. Enraged, Don José murders Carmen. Among the familiar songs from Carmen we have the March of the Street Urchins, the Wooing Song, Habañera, the Letter Song, the Flower Song and who doesn't know the Toreador's Song? In 1943, Oscar Hammerstein II adapted Bizet's opera for the stage, calling it Carmen Jones. He kept the main storyline and the music, but changed the setting and lyrics considerably (remember "Beat out dat rhythm on a Drum"?) by transporting it into the American South. The film version of the musical starred Harry Belafonte as Joe (the Don José character), Dorothy Dandridge as Carmen now working in a WWII parachute factory and Joe Adams as Husky Miller - the Toreador has become a sporting celebrity more suited to the new setting, a boxing champion. For sheet music, the full "Jeux d'Enfants" for piano duet is highly recommended and is available in a number of editions and arrangements such as this one from Music Room. From Sheet Music Plus in the US you will find a large variety of tunes from carmen arranged for various instruments and this piano arrangement of the music from l'Arlesienne.